Ghugni is the Bengali name for a chickpea based street food in Kolkata. The pasta dish I am about to describe is inspired by a Moroccon tagine dish. When I cooked Moroccan tagine for my friend’s daughters they instinctively called it Moroccan Ghugni. I decided to call this pasta dish Morccan Ghugni to remind me of them whenever I cook this for a quick weekday supper. The recipe serves as light supper for 2 adults and takes about 40 minutes to prepare. You will need to soak 1/2 a cup of dried chickpeas overnight or you could use tinned chickpeas. Start by chopping 1 white onion into thin slices. Add the onion to a sauté pan along with 1 tbsp of olive oil and 1tsp of black pepper. Cover the pan, set the stove to a low heat and allow the onion to sweat down. Chop 2 medium sized carrots diagonally into 1 cm sized cylindrical pieces. Add the carrots to the onions and stir the mixture. Further add 1 chopped tomato, a few gloves of garlic minced,1 tsp of cumin seeds, 1 tbsp of cumin powder to the sauté pan. Lastly add the soaked chickpeas to the spicy mix. Turn up the heat and give the mixture a good stir to allow the tomatoes to soften and the cumin powder to fry. Add a small amount of water to the pan to cover the base of the pan so as to stop the mixture from sticking to the bottom of the pan. Bring the water to boil. Turn down the heat and allow it to simmer. Heat some water a big sauce pan in preparation for the pasta. Allow the mixture (hereby referred to as Moroccan Ghugni) to stew over slow heat. Keep an eye on it to ensure it does not stick to the pan. For the collard/spring green use about 10 big leaves of the greens. Remove the stems and cut the leaves into thin stripes. If unsure check this instruction video. Check the Moroccan Ghugni. Add some salt and heat of your choice (green or red chilies) and ensure you like what you eat. Cook about 70 gm of penne pasta per person. Cook the pasta for about 5 minutes and then add the greens. Cook for another 5 minutes to soften the greens. Drain the pasta and the greens and add it to the Ghugni. Drizzle extra virgin oliver oil over the mixture.Stir it gently to mix it well. 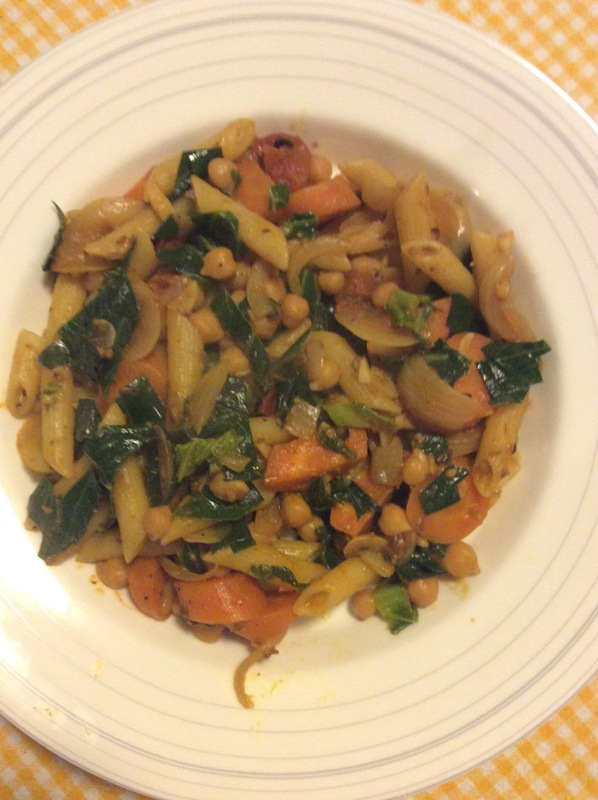 This entry was tagged carrots, chick peas, chickpeas, collard greens, ghugni, pasta, spring greens. Bookmark the permalink.